Most manufacturers give you a choice of ceiling heights and a few decorative ceiling features. You can add character to a room by having the manufacturer slope the ceiling about 18 inches from the outside wall to the marriage wall. Adding a tray ceiling in a room will also dress it up. For the most dramatic effect, design a room with vaulted or cathedral ceilings. The ceiling heights offered by most manufacturers for flat ceilings are 8 feet and 9 feet, although a few manufacturers build their homes with 7-foot 6-inch ceilings. Some manufacturers build the second floor of an unfinished Cape Cod with a 7-foot 6-inch ceiling even when the first floor is 8 feet. Upgrading a one-story or two-story to a 12-in-12 roof pitch with these companies will usually give you the same 7-foot 6-inch ceiling in the attic. A home with a stepped roof, which is created when you have a plan that is narrower on one end than the other, might have a 7-foot 6-inch ceiling in the narrower section even when it has an 8-foot ceiling in the remainder of that floor. Almost all manufacturers offer 9-foot ceiling heights as an option. Because of the shipping height limitations, however, it is more difficult to ship modules with 9-foot ceiling heights that have a roof over them. Ranches, CapeCods, and the second floor of two-story designs all push right up against the maximum-height regulation. Sometimes the only way to make this work is to change the roof trusses, which will add to the cost of the taller ceilings. Manufacturers also make this work by delivering the modules with the roof overhangs detached from the roof, since this sometimes reduces the height just enough to meet the regulations; either the set crew attaches the overhangs or the GC does so immediately after the set. This does not work for all manufacturers, however, and it is especially difficult to do with taller roofs, since they require a roof design that folds twice, with the second flip on top of the first. The additional flip makes it harder to comply with the height restriction. If you select 9-foot ceilings – it is a very popular option – consider using taller windows to complement the additional ceiling height. The tall windows can be installed at the same sill height as standard windows, providing room for furniture under the window, although they are more commonly installed closer to the floor. With 9-foot ceilings, you have to decide how to handle the additional space above the wall cabinets in the kitchen. Modular manufacturers can build a sloped ceiling that adds 12 to 18 inches of pitch from the outside wall to the center. The roof load is carried by a beam, usually finished in drywall, that drops below the ceiling at the marriage wall. This may require a 7-foot 6-inch ceiling height where the bottom of the slope begins as well as on the remainder of the house. And it will only work with a 5-in-12 or 7-in-12 pitched roof. Two ways to increase the ceiling heights in individual rooms of modular homes with a tray ceiling. The manufacturer can create a tray ceiling in a room of your choice by building a soffit around the perimeter. You can embellish the tray with crown moldings both inside the tray and where the soffit joins the wall. If you build a two-story home, you will have an additional way to build the tray on the first floor. 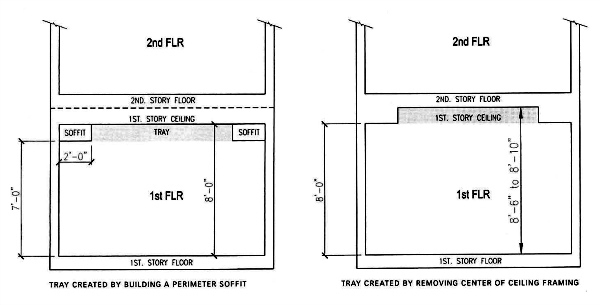 Since a modular two-story has a ceiling on the first story that is independent of the floor of the second story, it is possible to remove the entire first-story ceiling within a room except around the border. Keeping the ceiling along the border creates the soffit needed for a tray ceiling. A nice additional benefit of this tray is that you raise the ceiling height in the room; a traditional dropped soffit creates a lowered perimeter rather than a raised ceiling. 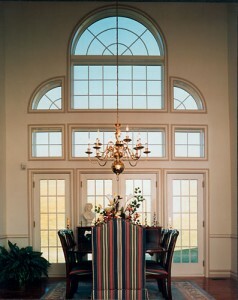 A vaulted ceiling along with a Palladian window lends an air of majestry to this dining room. 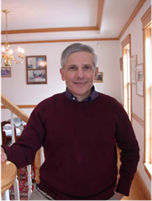 When designing a home with vaulted or cathedral ceilings, plan the lighting carefully. For example, consider a chandelier in a two-story vaulted foyer, since a small foyer light will look out of place. You may also want a ceiling fan to help recirculate the air. 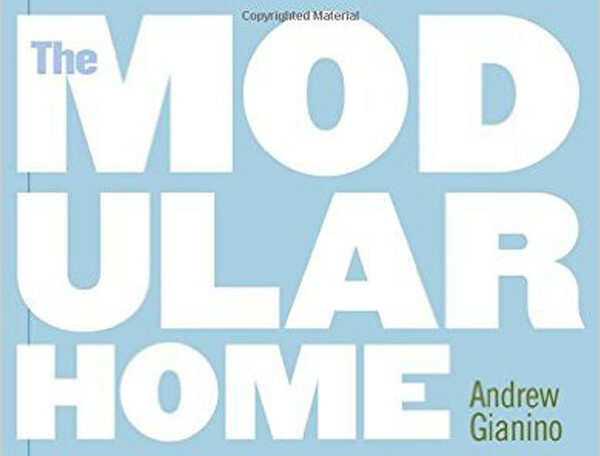 For more information about ceiling heights, see Designing a Modular Home and Modular Home Specifications and Features in my book The Modular Home.